The Paleo Diet is the latest and greatest of fads in the realm of diets. We have gone from Weight Watchers to Atkins to South Beach only to realize that what our ancient ancestors ate is probably what we should be eating too. After all, homo erectus didn’t have the convenience of grabbing a burger and fries from the local fast food joint while looking for a new cave. No sir or maam, the diet that the human race survived on is no joke. So, with all of the hype about eating paleo and reading paleo blogs like Mark’s Daily Apple and Son of Grok, I decided to try the paleo diet. It was time to cut out the processed foods and consume fresh vegetables, fruit, lean proteins, nuts and good fats with a little luck thrown in. I expected to do well on the paleo as I did quite well with the No Flour, No Sugar diet in 2009. It really isn’t that much different, although it is much more strict about what you can eat (no potatoes, no vinegar and no grains). So what could happen? Well, I found out just how hard it is to eat paleo consistently. For me, I need to have each meal prepared ahead of time or else I will settle for something more convenient than paleo. The somewhat limited food items get boring after a while, so creativity in the kitchen is soon to be expanded. The diet requires a lot of preparation ahead of time, so squeezing in time in the kitchen is hard with my already packed schedule. The grouchiness is a little like giving up coffee as the body is adjusting to life without an abundance of refined foods. Well the word cloud to the left shows exactly what I have been eating. While I haven’t been sticking to the diet per se (burritos and mochas aren’t paleo! ), I do see the beginnings of ridding processed foods from my diet. Getting rid of the tortillas and buying a coffee versus a mocha will be the next steps. I’d also like to see more lean proteins in the cloud as it appears that chicken and bacon are the primary meats I’ve eaten. What is good are the nuts, fruits and vegetables, but those too can use a bit more variety. What are the initial results of going more paleo? I feel like I have increased energy and clarity of mind. My weight has only dropped three pounds, which is within a normal fluctuation so I can’t say I’ve lost weight. Also, my kitchen is being used more and my stove is happy to see me, if for a limited time on the weekends. My grocery bill has also gone up, but my fast food bill has dropped significantly. So there are pluses and minuses involved, but overall I think the changes have been positive. However, Before coming to further conclusion, I’d like to gather more data, both physical and workout data. 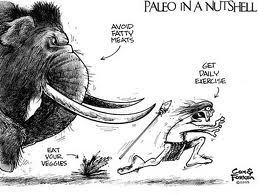 Theoretically, the paleo diet will help me improve my fitness performance and if its true, the results should be clear in my triathlon training dashboard. Only time will show. Have you tried the paleo diet? What are your experiences? This entry was posted in Goals, Nutrition, Paleo Diet, Tips, Tools, triathlon training and tagged fuel, Nutrition, Paleo Diet, Triathlon. Bookmark the permalink. I haven’t tried the Paleo diet, but I admire its discipline. As far as tortillas, I think you could safely include corn and/or rice tortillas and still be in safe territory.